This blog is produced by members of the School of Politics and International Relation at the University of Nottingham, and by regular guest pieces. The analysis contained in each entry is informed by our internationally-ranked research, and we hope it will help readers better understand the political dynamics that underpin the world in which we all live. The School of Politics and International Relations takes no institutional position and all authors views are their own. Does Brexit really realise the ideals of JS Mill? Mohammad Bin Salman’s Ambitious Moves: Order or Disorder in Saudi Arabia? This is the second of a regular series of posts that report on the state of the parties as measured by opinion polls. By pooling together all the available polling evidence we can reduce the impact of the random variation each individual survey inevitably produces. Most of the short term advances and setbacks in party polling fortunes are nothing more than noise; the underlying trends – in which we are interested and best assess the parties’ standings – are relatively stable and little influenced by day-to-day events. If there can ever be a definitive assessment of the parties’ standings, this is it. Further details of the method we use to build our estimates of public opinion can be found here. Our most recent update on public support for the parties, taken on May 1 just four days before voters across the UK went to the polls in national and local elections as well as the referendum on AV, suggests a slight weakening of the Labour lead over the Conservatives during May, and a slight upturn in support for the Liberal Democrats. 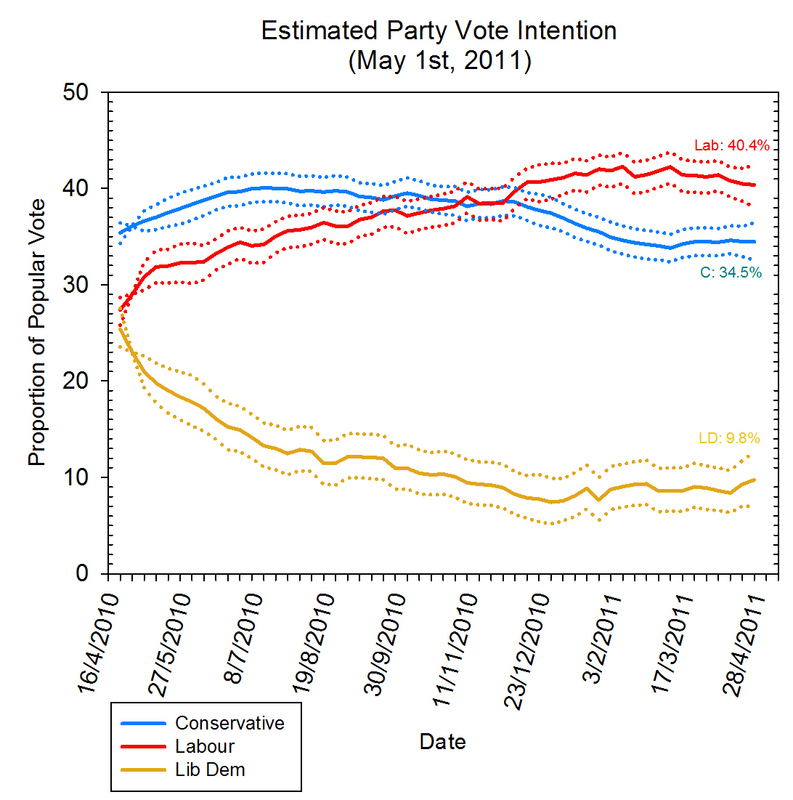 Our current estimate for the Conservatives stands at 34.5%, around the same level as we identified last month. Support for Labour, at 40.4%, is about a percentage point down on the end of April. The Liberal Democrats have experienced a slight improvement from the lows of last month, with our estimated poll share now putting them at 9.8%, more than a percentage point higher than in April. What this suggests is that – notwithstanding the sound and fury provoked by the May elections – the three parties remain very much as they were. However, Labour’s recovery since the 2010 election seems to have stalled while, despite their slight recovery, Nick Clegg’s party remains in deep trouble. As with the May elections, our poll finally suggests that it is the Conservatives who should be the happiest. In spite of cuts, tuition fees and mooted NHS reforms, support for David Cameron’s party is holding up better than expected.